A series of piperidyl-thienyl & 2-pyrazoline derivatives of quinolyl-thienyl chalcones were tested to observe the structural characteristics for the monoamine oxidase inhibitory (MAO) activity. In both these series, a diverse range of substituted thiophenes are used which enable the structure activity relationship. The compounds showed enhanced inhibition against MAO-A & B as compared to reference compounds. Compound 1c exhibited most potent MAO-A inhibition having IC50 value of 0.062 M, while 1j showed excellent inhibitory potency against MAO-B having IC50 value of 0.088 M. The present investigation demonstrated that among piperidyl-thienyl chalcones, almost all the compounds exhibit significant MAO-A inhibition, thus may have antidepressant activity. Whereas among the 2-pyrazoline derivatives of chal-cones, many compounds revealed MAOB inhibition and hence may be applied in the control of senile dementia. 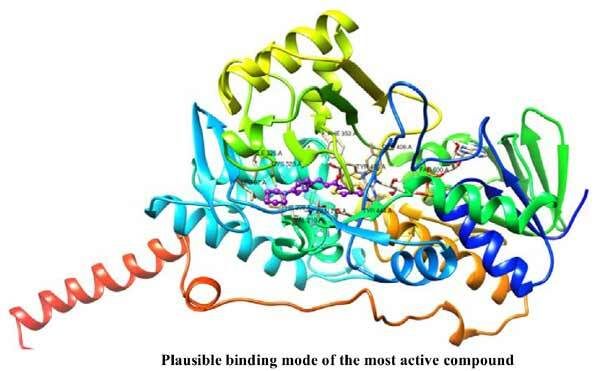 Molecular docking studies were carried out against human MAO-A and MAO-B to rationalize important binding site interactions. Antidepressant activity, molecular docking, monoamine oxidase, piperidyl-thienyl derivatives, quinolyl-thienyl chalcones.